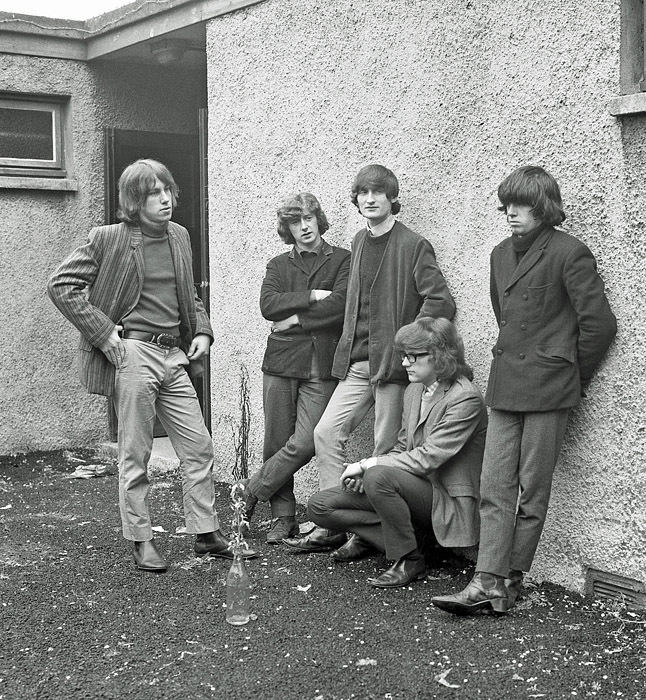 Rockingscots is a website dedicated to Scottish beat groups of the '60s and early '70s. Visit the Rockingscots homepage for more groups or to e-mail us. John Young is a professional photographer of many years standing. In the '60s and early '70s he photographed many groups and solo artists performing around the West of Scotland and elsewhere. Here are some of his favourites from that period. N.B. please. No reproduction of any photograph is allowed without the permission of John Young. 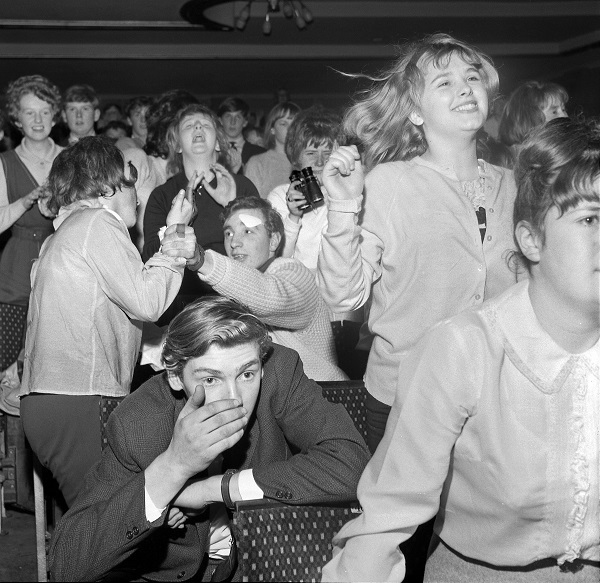 Lots going on among the audience - sheer female exuberance & stunned male faces. John Young's pic has also captured what looks like a bloke trying to restrain a fan - possibly his girlfriend. Every picture tells or suggests a story. 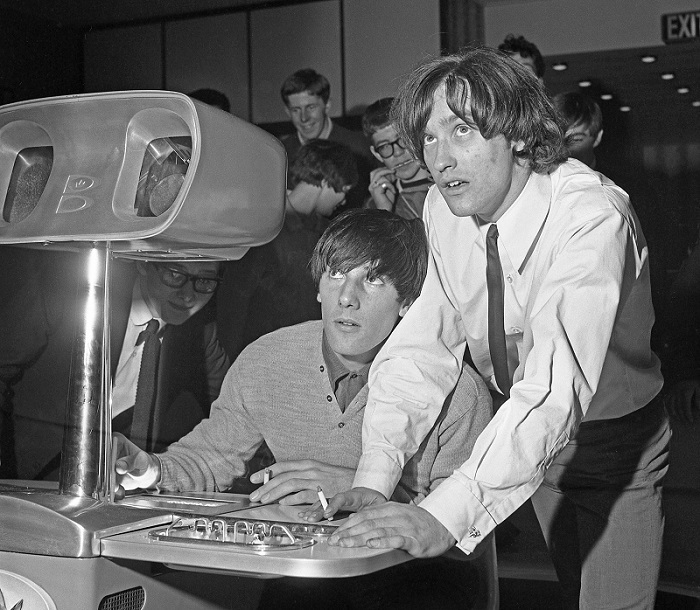 Paul's attention is caught by something off stage. 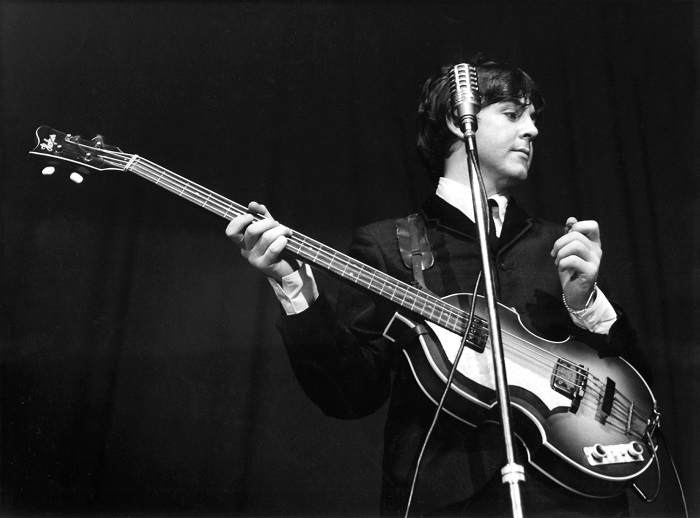 John lays off playing the guitar to concentrate on his vocals. The small objects on the stage are Jelly Babies thrown by the fans - George had said they were his favourite sweeties! NEXT: SOME PICS of PAISLEY GIGS. 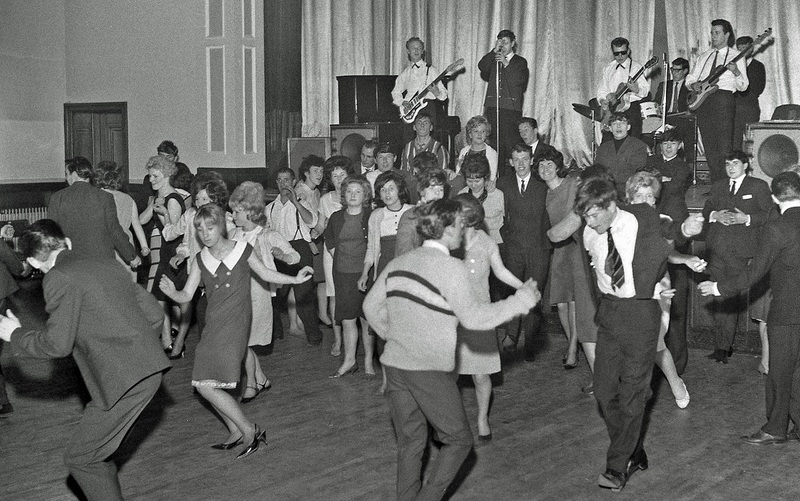 Dance at Paisley's Templar Halls on the early evening of Friday 22nd November 1963. JFK had been shot in Dallas some 20 mins previously. The news had not yet got through to those in attendance. Some great styles on view - beehives were still popular with the girls. But note the young, fair haired lass doing the twist out front with her Mary Quant like cut and Mod style dress. Italian styled suits for the boys with a winklepicker and cuban heel or two on show. Men's hair was still short though Teddy Boy quiffs had gone. The early evening audience are concious of the photographer and no one is looking at the band. Note Kidd's regular foorwear in the corner - ankle length, cuban heeled, elastic sided, pointy toed boots. Some of us still like 'em and wear 'em! 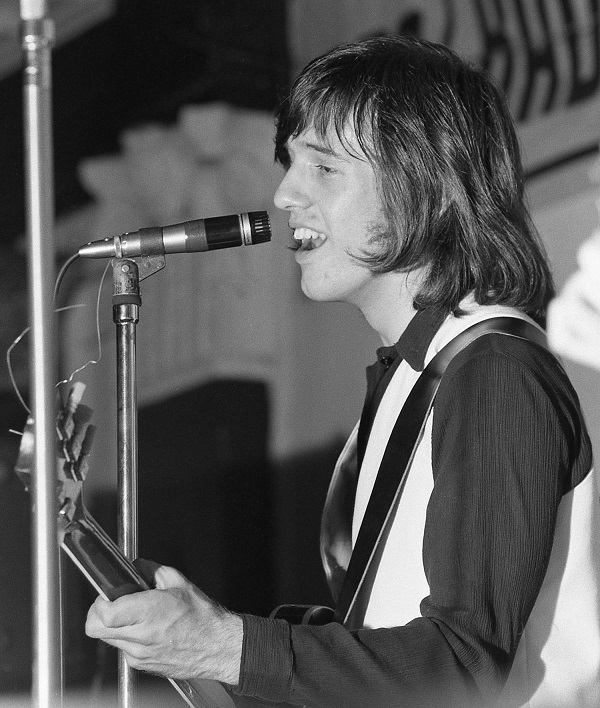 Kidd - real name Freddie Heath - wrote maybe the greatest British Rock and Roll song - 'Shakin' All Over'. The bloke who played the classic riff and solo on the recording was the Glasgwegian guitar maestro Joe Moretti. 'We Are Not Worthy!' as they say. 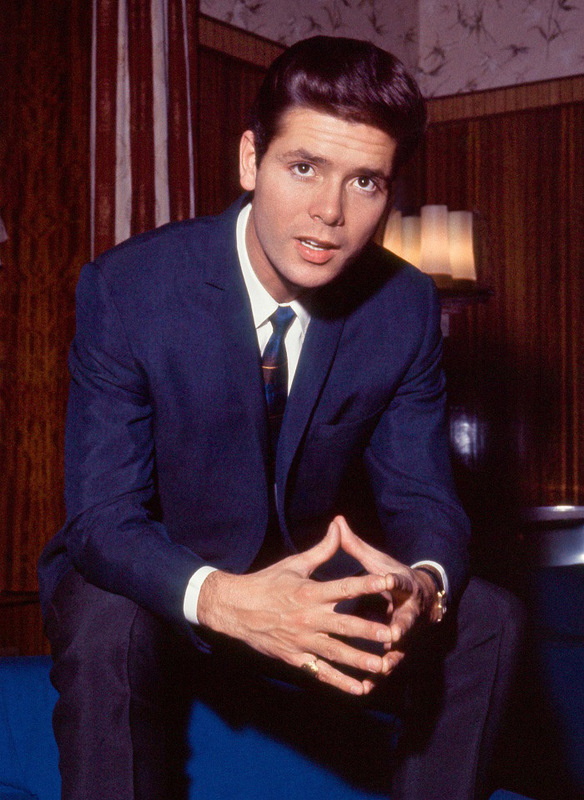 Taken in '65/'66, here's a fantastic pic of those times and fashions - long hair, Cuban heels and moody looks. The others seem to be wondering why the guy on the far right has brought them out to see a milk bottle with twigs sticking out of it. Taken at the back of a community hall somewhere in the Glasgow area is all the photographer John Young can recall. Stewart Mckenzie? (drums); Jim Thomas (lead guitar). Thanks to Gordon McFall for identifying Ian Clews prior to his move to the Pathfinders and to Sandra Cochrane Kerr of the Paisley FB site for the rest. 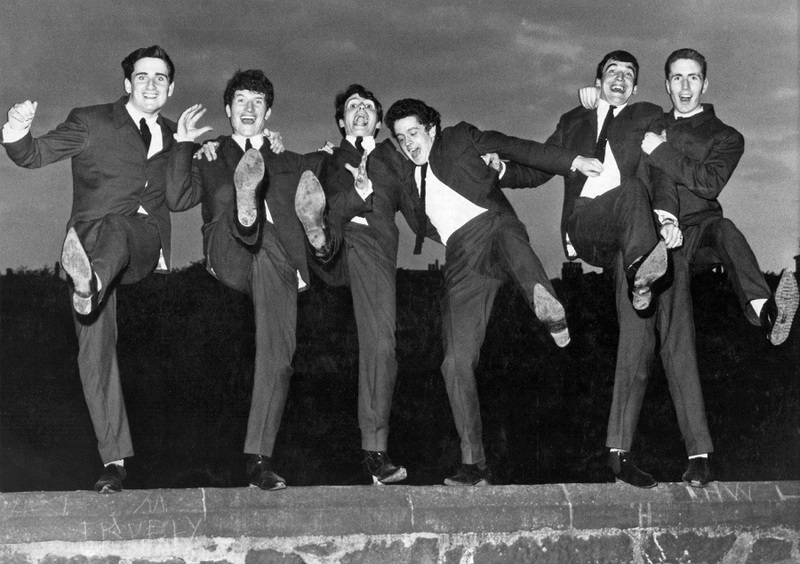 John took this terrific photo c.1963/64 outside the Dungeon Club in Barrhead where they were due to play. Dennis Bell (Drums) & Danny McInally (lead guitar). Many thanks to Neil Dunn, Elizabeth Anne, Betty Allen, John Forrest & Kizz Ferguson of the excellent 'Paisley' FB site for filling in who's above. Neil even used to dep for Chic on a Tues night at the Templars when he was at night school. Note the health and safety conscious Danny's non-slip soles and two handed grip on his colleague. 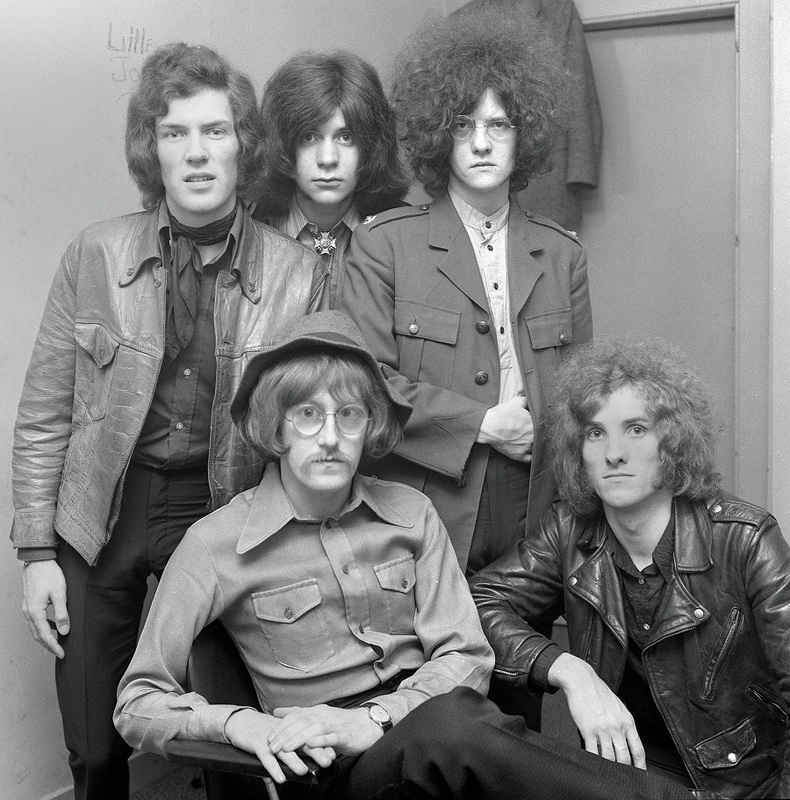 Apparently, the band struggled to insist that they be billed as "Maverix" and not "The Maverix" or "The Mavericks"
Joe Egan and Gerry Rafferty became members later on. 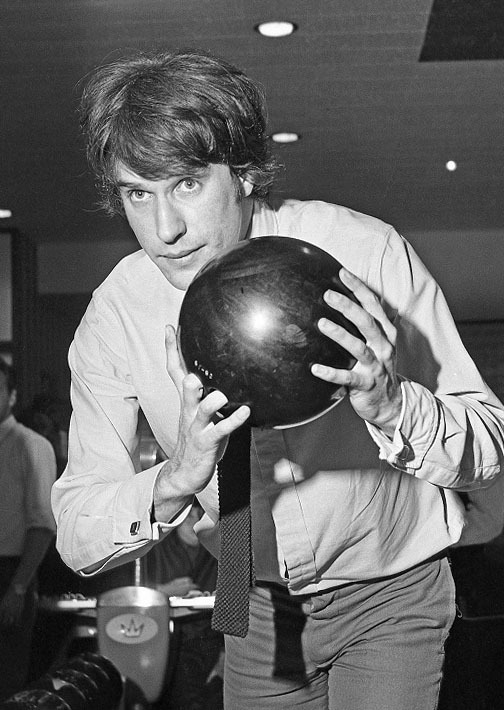 John assures us that that Alan Clarke's head is normal - his jacket has just been pushed up to hang from a peg. Eric Haydock & Tony Hicks. 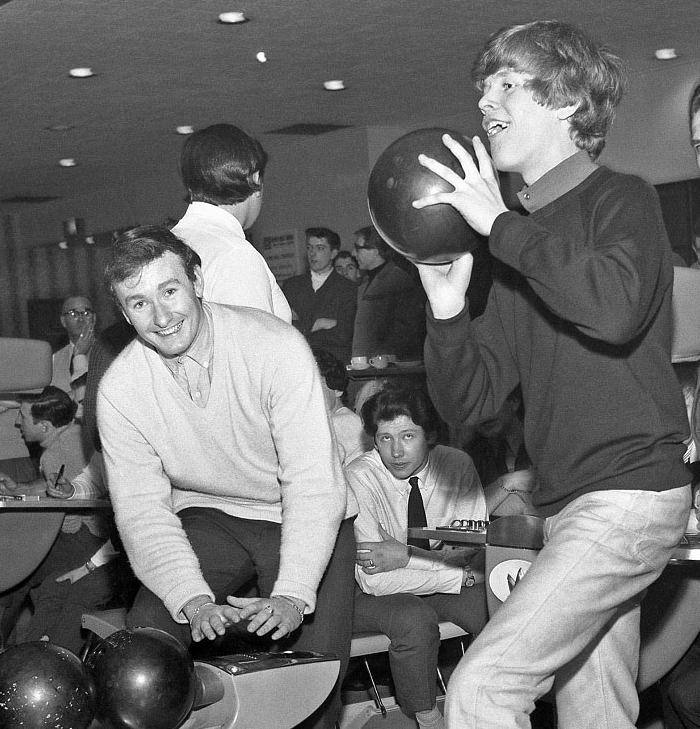 The Merseybeats in very fancy shirts - backstage at Paisley Ice Rink - 18 June, 1964. Aaron Williams (rhythm guitar); Johnny Gustafson (bass); John Banks (drums); Tony Crane (lead guitar and lead vocals). Mr Gustafson - what a stare! 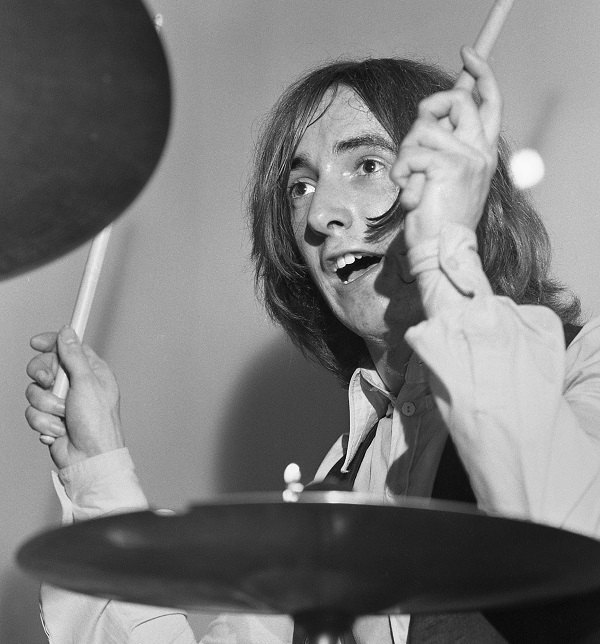 - also played in The Big Three, Quatermass, Roxy Music, etc, etc, etc.. 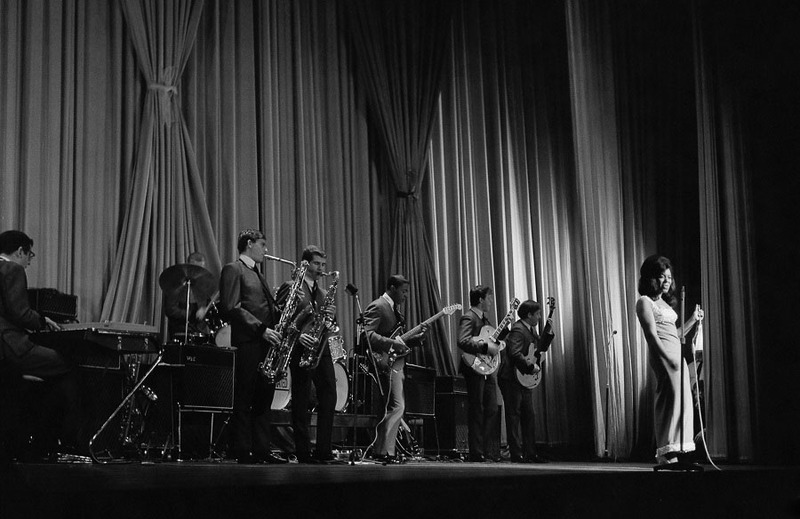 He was only with the band for a few months in 1964 so photos of this line-up are probably quite rare. Tony's 335 style guitar seems to have had the Bigsby bridge and tremelo added. The retaining screws for an original tailpiece are visible before the bridge. Aaron's guitar looks like a Firebird - note the machine heads are behind the middle of the headstock rather than above or below. 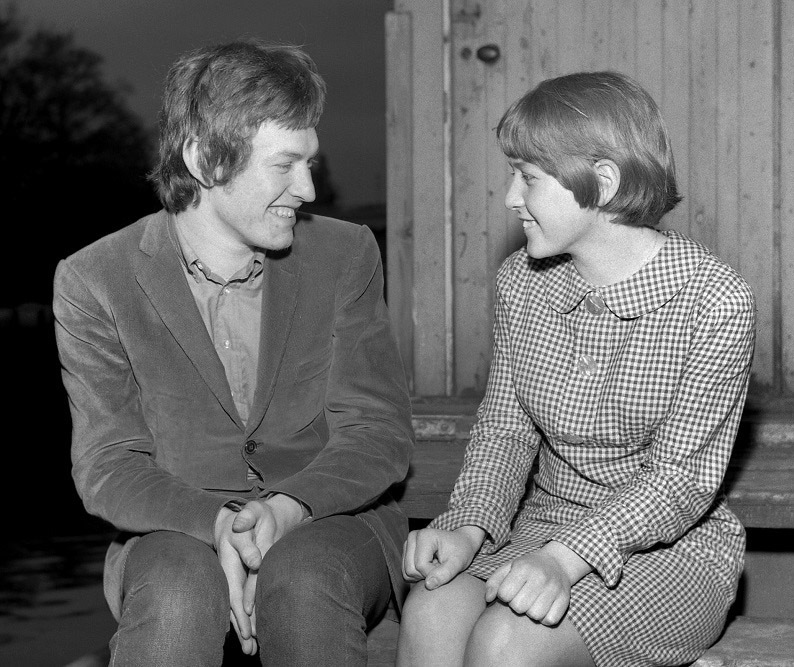 Steve Winwood chats to a fan. 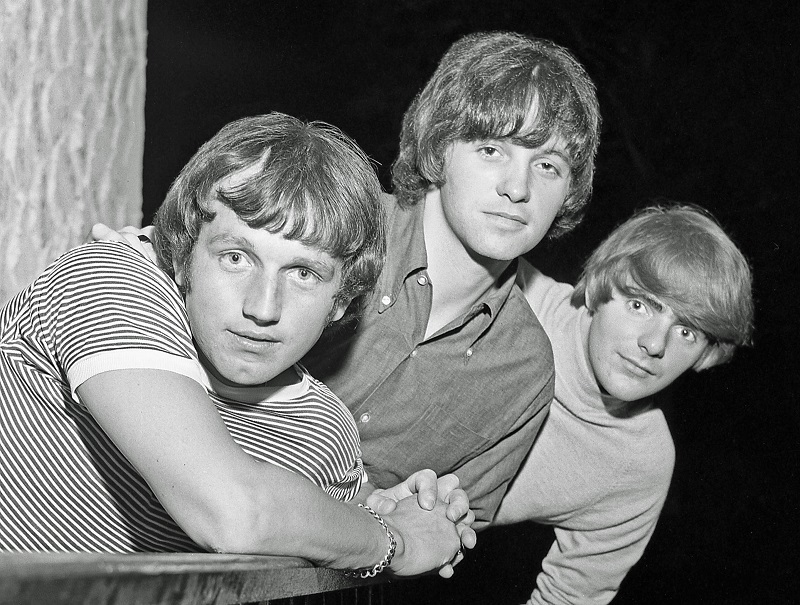 Ric Rothwell (drums), Eric Stewart (guitars & vocals) and Bob Laing (bass). 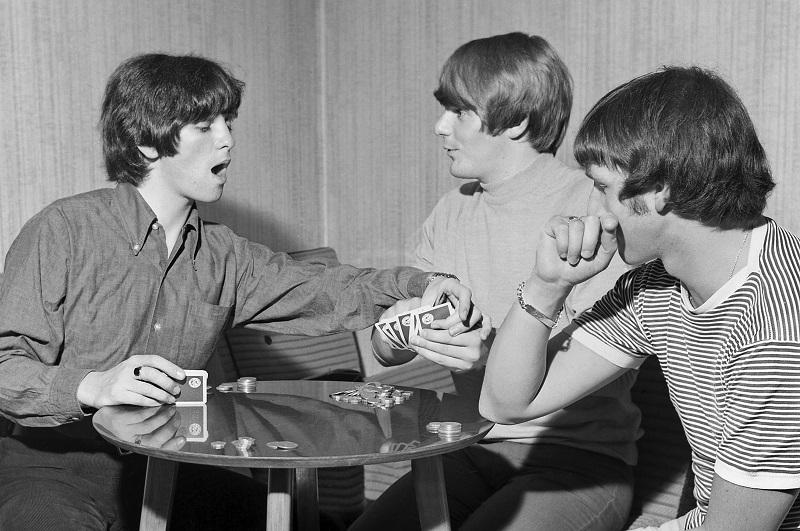 Taken at a hotel near Glasgow's Cathkin Braes after a gig at the Olympia East Kilbride, June 1966. Eric disputes a point in a card game..
Great photo from a morning photoshoot at a hotel in Sauchiehall Street, Glasgow. The Poets' Hugh Nicholson above and Dougie Henderson below. 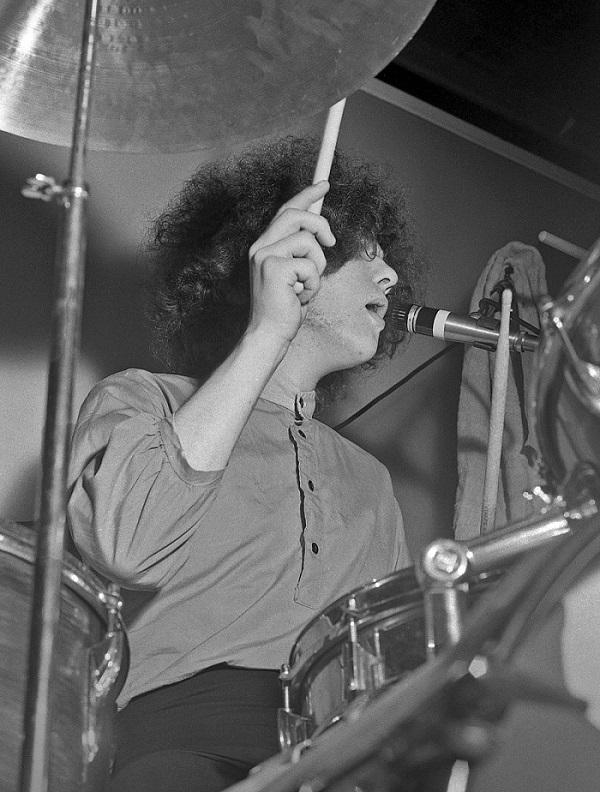 Taken at the Electric Garden, Sauchiehall St, Glasgow in 1969 at what John recalls was a Radio event - Probably 'Radio One Club'. Eddie Campbell & Wullie Munro getting dressed. Davie Batchelor and Eddie Campbell check they're looking sharp. Eddie Campbell - Keyboards; Alistair 'Zal' Cleminson - guitar. Wullie Munro getting stuck in. 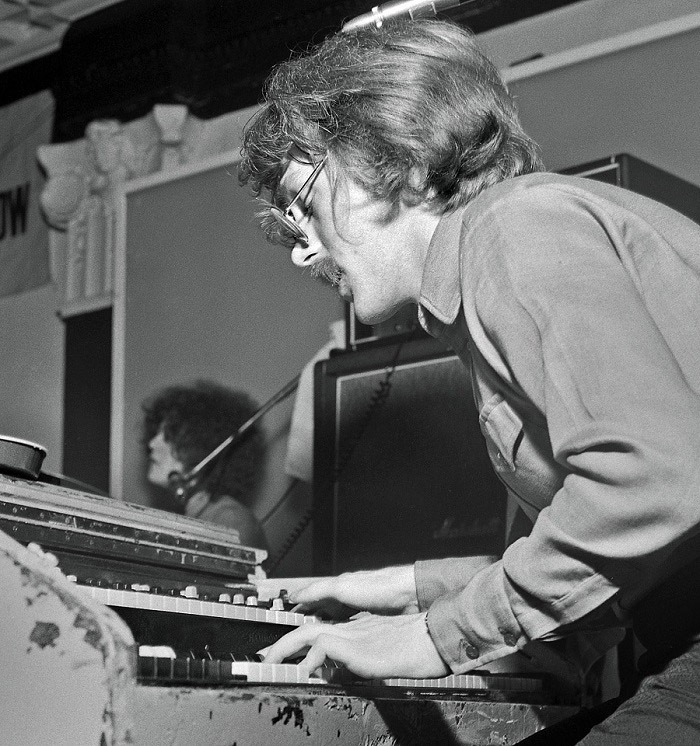 Eddie Campbell on the Keys - Wullie Munro in the background. 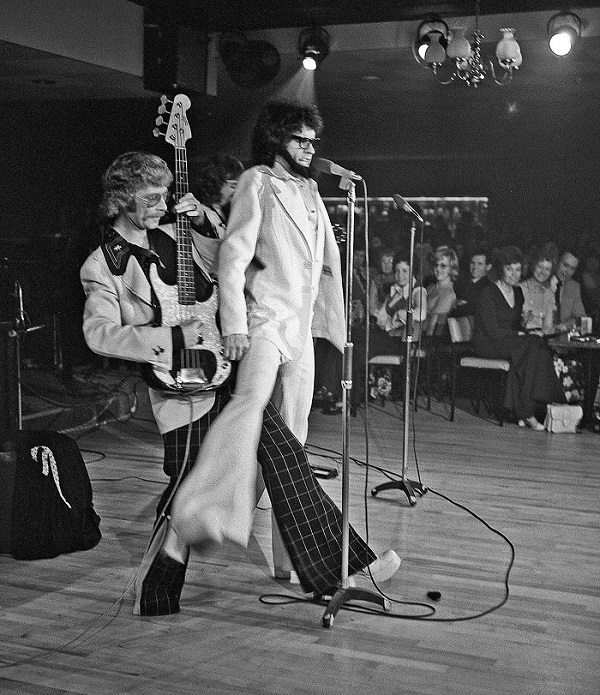 The Rockin' Berries - Darlington Hotel, Ayr - Nov. 1974. Bass player Bobby Thomson backing up singer Terry Webster as he does his Rolf Harris routine. 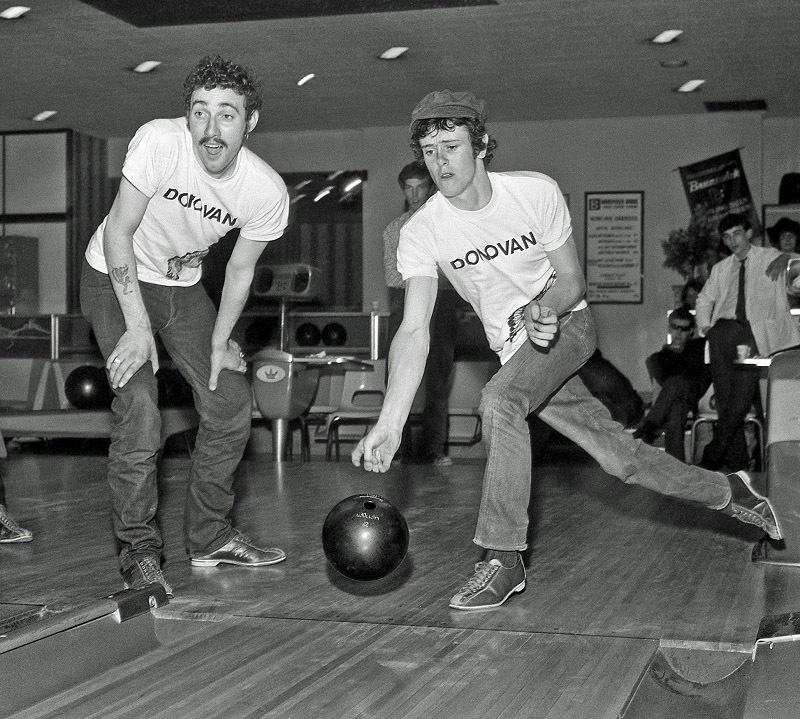 A few shots on a favourite theme - bands bowling at Hampden Bowl - Mount Florida, Glasgow. 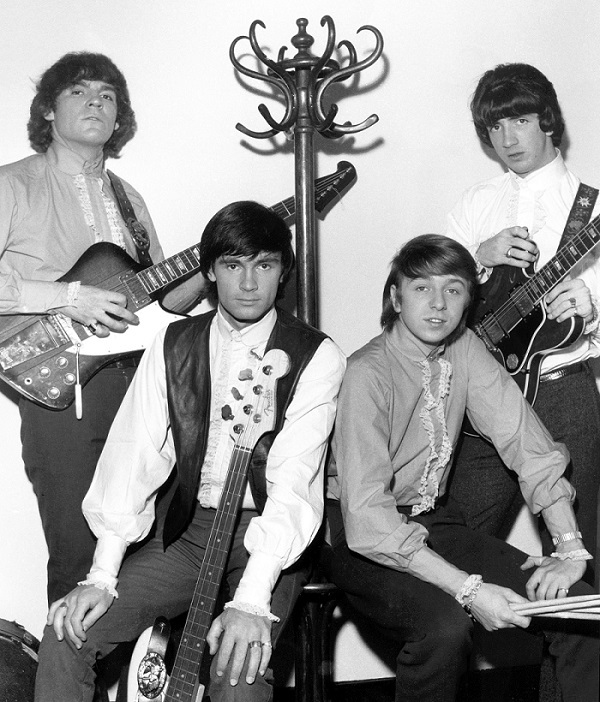 The Rockin' Berries - March 1965.
l-r: Terry Bond (drums); Chuck Botfield (lead guitar); Clive Lea (vocals/impressionist); Bobby Thomson (vocals/bass guitar); Geoff Turton (vocals). 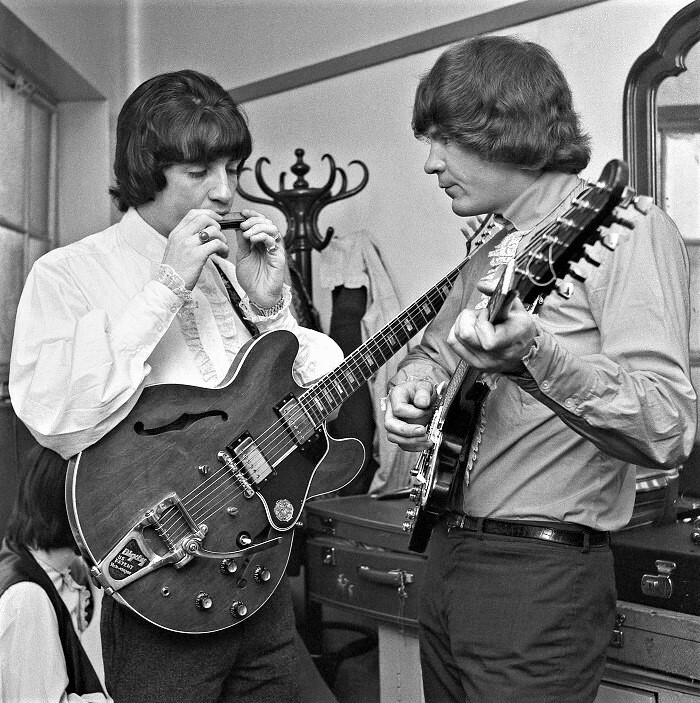 Brian Poole of the Tremeloes fame and Peter Noone from Herman's Hermits. 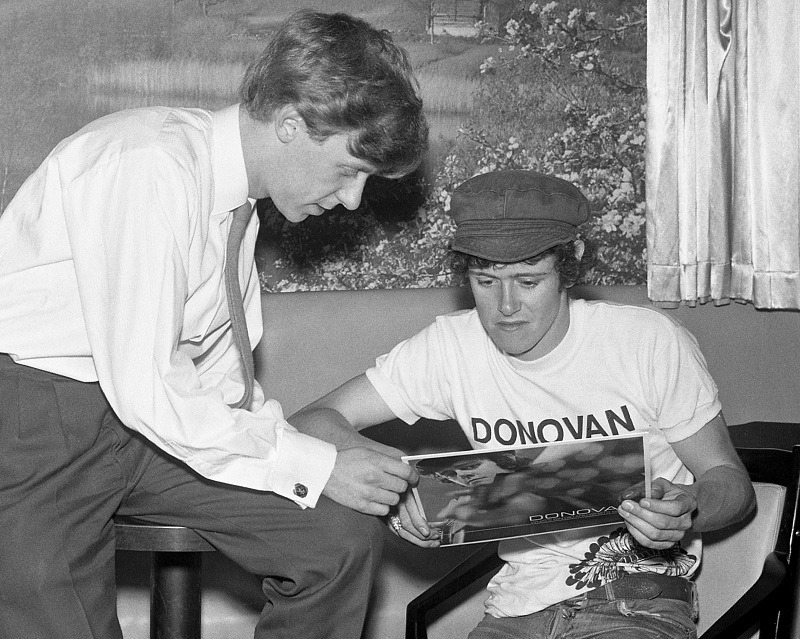 John offers Donovan some photographic advice for the back cover of his next LP! 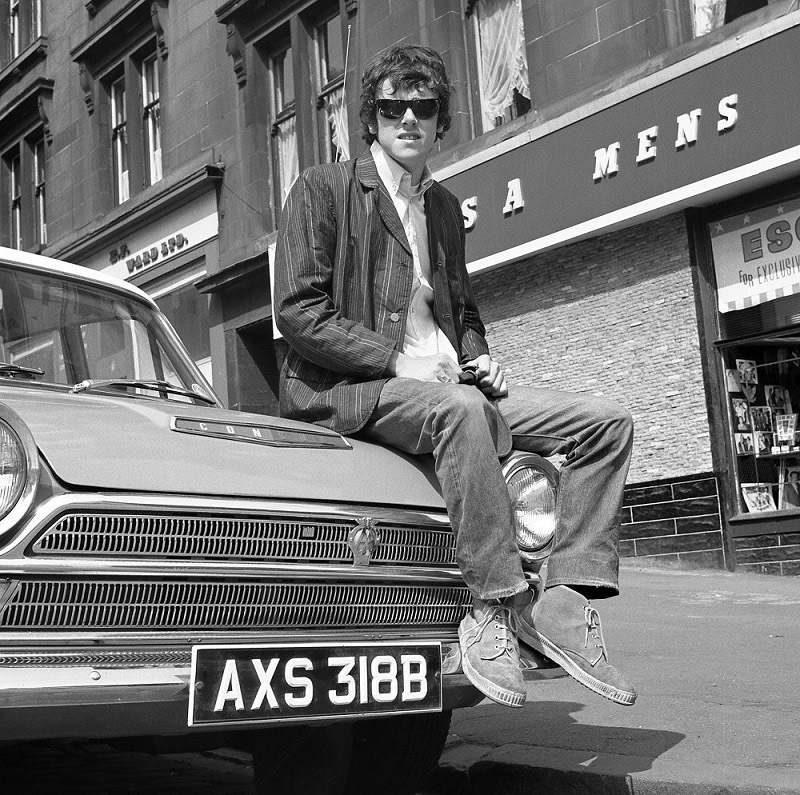 Donovan outside Esquire Mens' Fashions in Maryhill, Glasgow. pic (c) John Young. 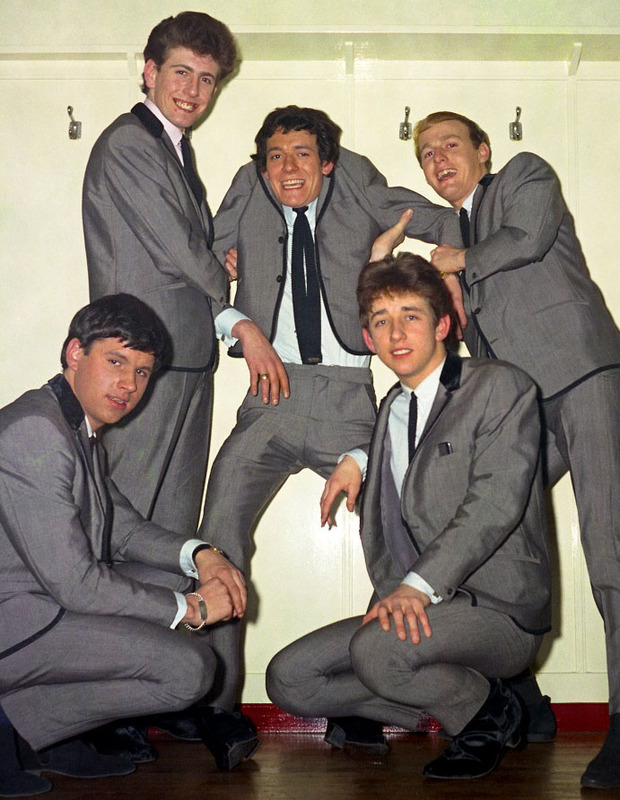 The Kimbos - a great fun pic of a smartly dressed early '60s group. 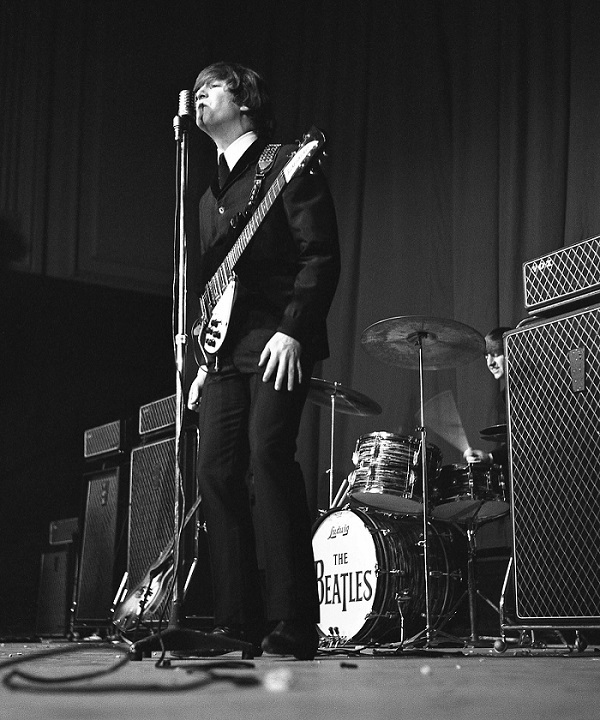 Taken by John at the Olympia in East Kilbride - to the best of his recollection. Anymore info on the Kimbos gratefully welcomed.